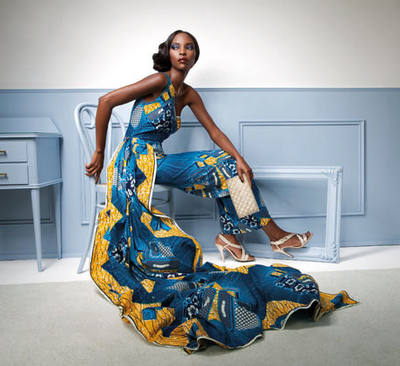 I really love the Vlisco billboards throughout Accra because they portray black women as elegant. They can be beautiful in their own clothes. A seamstress or tailor can then create a dress based on the woman’s measurements and a photo of the desired dress. The office manager mentioned that you can go to Nima, one of the slums, and get a dress made for C5 ($3.33). Thus, even poor women who sells fruit on the street can look beautiful if she has a good eye for fabric. She also recommended a seamstress who came from the UK who charged C30 ($20). Since making your own clothes is affordable, I have found that there are no branded retail stores here. There are Woodin retail stores but 80 percent of their store is devoted to fabric while the remainder is for ready-to-wear clothes. There are boutiques but they are few in number. Not having internationally recognized brands to shop can be one of the challenges to living here for women from the developed world. Men can also have clothes made for them. In fact, Fridays are African Dress days. Men can either wear business casual or a traditional outfit. While I am on the topic of clothes and fashion, I also learned that women are expected to be modestly dressed. Women usually cover their breasts – no cleavage – and skirts/shorts should be at knee-length or longer. Despite this expectation to cover up, I find it odd that the culture does not condemn women who wear tight-fitting clothes. A couple exceptions: 1) Bikinis and Western swimsuits are fine because you are at the beach; 2) obruni women are given a pass for not knowing any better.